Pearlwort Saxifrage is a perennial herb which makes a mosslike growth of extensive hard cushions over rocks. 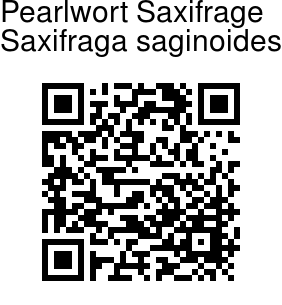 Its species name refers to its superficial resemblance to the Sagina plants, commonly called pearlworts. Stem is extremely short, 3-9 mm, brown crisped glandular hairy. Basal leaves have leaf-stalk 3-4.8 mm, margin brown crisped glandular hairy; leaf blade almost oblong, 3-4 × about 1 mm, hairless, tip subblunt. Stem leaves are linear, thick, 4.9-6.8 x 0.8-1 mm, both surfaces hairless, margin brown crisped glandular hairy at base. Flowers are solitary; flower-stalk 0.7-3 mm, densely brown crisped glandular hairy. Sepals erect, ovate to subelliptic, 2.1-2.6 × about 1 mm, hairless, veins 3 or 4, not confluent at tip, margin sometimes brown crisped glandular hairy at base, tip blunt or pointed. Petals are yellow, ovate to narrowly so, 3.4-4.4 × 1.5-1.9 mm, not or obscurely 2-callose, 3-veined, base contracted into a claw 0.7-0.8 mm, tip blunt. Stamens 1.5-2.9 mm. Ovary subsuperior, subovoid, about 1.5 mm; styles about 1.4 mm. 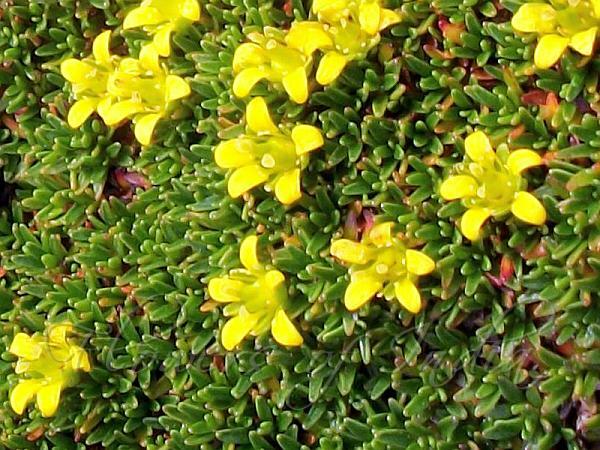 Pearlwort Saxifrage is found in the Himalayas, from Garhwal to Bhutan, S. Tibet, W. China, altitudes of 4000-5200 m. Flowering: July-September. Identification credit: D.S Rawat, Tim Roberts Photographed in Paddar Valley, Jammu & Kashmir.